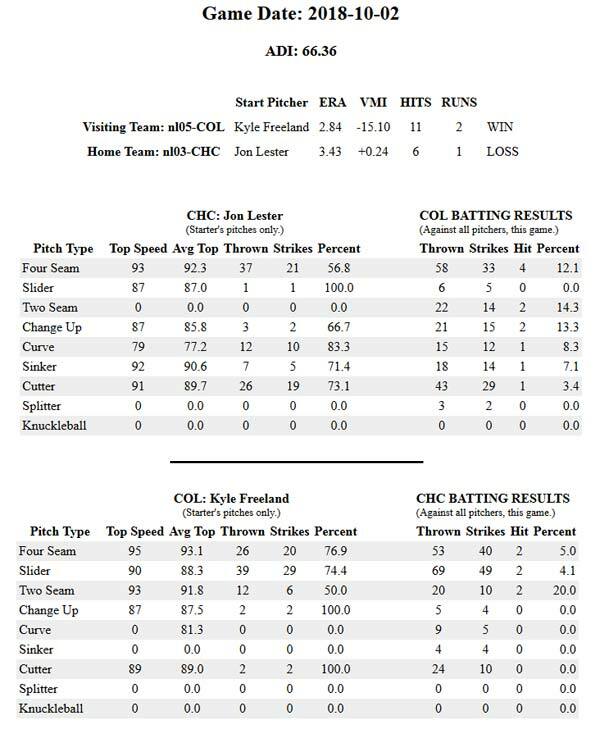 For a young pitcher, Kyle Freeland for the Colorado Rockies appears to be a "heady" pitcher. Freeland's normal repertoire is 38% Four-Seamers and 29% Sliders. However, sliders have been slightly more effective against the Cubs in 2018 than the Four-Seamer. In the Wild Card matchup against the Cubs, Freeland threw 39 Sliders against only 26 Four-Seamers. Both pitches were effective against Chicago, but the Slider was once again the better pitch. Most MLB pitchers do not appear to know that would be the case ahead of time, much less act upon it. In his, or the coaches studies, someone decided to go big with Sliders and it worked out for Freeland and the Colorado Rockies. Lester obviously did a good job against the Rockies, but Kyle Hendricks threw at least one too many change-ups.